Currently viewing the category: "Political"
There is nothing illegal about crossing a border to seek asylum. Refugees are not “illegal” and should have their human rights respected. 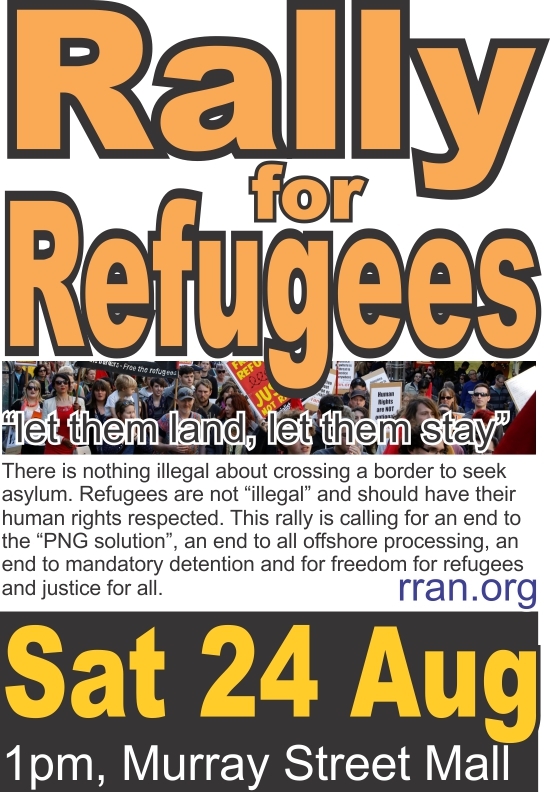 This rally is calling for an end to the “PNG solution”, an end to offshore processing, an end to mandatory detention and for freedom for refugees. By Tanya McConvell of Socialist Alternative. Originally published at sa.org.au. The powers that be can still shock us. And we know already what they are capable of! Republished from http://www.asrc.org.au/media/documents/asrc-submission-expert-panel.pdf (see this file for citations). A teenage Vietnamese asylum seeker has written to the Immigration Minister Chris Bowen accusing him of neglecting his duties as the guardian of children in detention. The Coalition’s latest asylum seeker plan is inhumane and lacks integrity.